Use in All Washers including HE! Thieves Essential Oil Natural Laundry Detergent Soap is green, and earth friendly! Plant based formula that is non-toxic, gentle and washes your clothes without harsh synthetic chemicals. It is made from the Thieves essential oil blend that everyone loves so much! I used to make my own homemade laundry soap, but this is much better! Why use Thieves Essential Oil Natural Laundry Detergent to do all your Laundry? Free from SLS (sodium lauryl sulfate), petrochemicals, dyes, formaldehyde, phosphates, synthetic fragrances and perfumes and artificial brighteners. Natural enzymes and powerful essential oils add to the formula’s ability to leave your clothes clean and fresh with a light citrus scent. I love to use this for the dog and horse blankets and towels. Keeps them smelling great and fresh. It contains the same oils found in Thieves Essential Oil which was designed to represent the "Four Thieves Vinegar" or "Marseilles Vinegar". This was originally made by grave robbers who worked in the spice industry during the 15th century. This is an easy reference guide for Thieves Essential Oil Natural Laundry Detergent. It will tell you how to use your product and what to use it for. It will also provide you with some fun tips and testimonials! Want to Purchase Essential Oil Natural Laundry Detergent? To purchase, Thieves Laundry Soap, go to The Oil Shop! What is in Thieves Essential Oil Natural Laundry Detergent? There are several natural ingredients as well as five therapeutic grade essential oils in Thieves Soap. Bergamot Essential Oil (Citrus aurantium bergamia) (Furocoumarin-free) This essential oil has a calming aroma which relaxes the mind and body. It has a long history of use for oily and troubled skin*. Eucalyptus Essential Oil (Eucalyptus radiata) is primarily used to support the respiratory system; and to soothe muscle discomfort after exercise*. What are the Documented Uses for Thieves Essential Oil Laundry Soap? Cleaning, laundry detergent and soap, cleaning pet beds and blankets, washing horse blankets and towels. Personally, I used less than suggested and there was plenty of soapy suds and the clothes came out perfect! Can this product be used around Animals? Yes, absolutely safe! Clean your saddle pads, blankets and towels. Your horse, your dog and your cat will thank you! Remember that so many horses get irritated skin under the saddle due to toxins in the saddle pads and blankets. What are the Safety Precautions for Thieves Essential Oil Natural Laundry Detergent? Flush eye very well if eye contact is made. If swallowed, drink plenty of water to dilute and flush out your body. Keep out of the reach of children. There is a whole line of Thieves products that are awesome! I use them all! Thieves Essential Oil, Spray, Thieves Toothpaste, and Thieves Fresh Essence Mouthwash are just a few, besides the wonderful Thieves Essential Oil Blend. 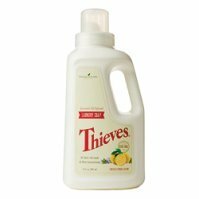 Must haves are Thieves Household Cleaner and Thieves Fruit and Vegetable Rinse and Wash! Want to Purchase Thieves Essential Oil Natural Laundry Detergent? Want to Write Your Own Experience about Essential Oil Natural Laundry Soap? Great, then just go to the Thieves Essential Oil Experiences Section to begin! Or read other testimonials about the entire Thieves line there! Thank you!